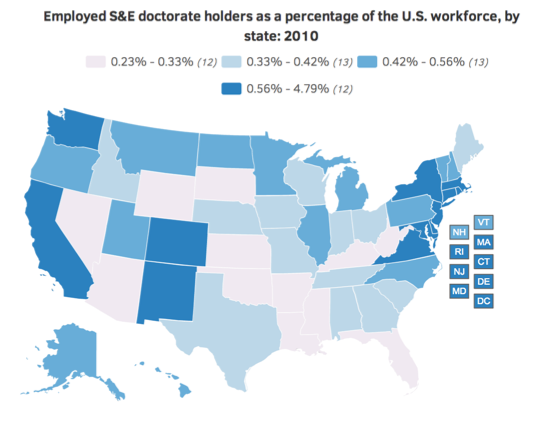 Employed S&E doctorate holders made up 0.49% of the U.S. workforce in 2010. The number of employed S&E doctorate holders in the U.S. rose from almost 573,000 in 2001 to about 688,000 in 2010, an increase of 20%. The percentage of S&E doctorate holders in the workforce ranged from 0.23% in Arkansas to 1.16% in Massachusetts. States in the top quartile tended to be homes to major research laboratories, research universities, or research-intensive industries.